Soil in a full sun to partly shaded site and you'll be blessed with gorgeous Turk's Cap-type lilies year after year after year. With a deceptively delicate appeal, it is actually remarkable strong with thick stems that grow up to 5½' tall! 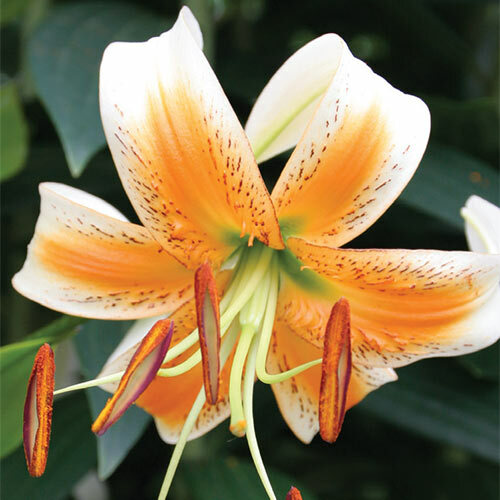 Icy white blooms feature raised, dark red spots and warm yellow-orange centers, and look magnificent perched atop the sturdy plants. Lady Alice is a fast, vigorous grower and bestows her beauty on back borders, cutting gardens and focal point plantings with ease. Suggest to customers that they plant her in groupings between perennials for even greater impact… and to enjoy her light, sweet fragrance that is emitted when the weather is hot and dry. Recurved petals (Turk's Cap look), flowers are approx 7" in diameter.